Located on the top floor of Shinagawa Prince Hotel, DINING & BAR TABLE 9 TOKYO, as the name of the establishment says, is a high-end food court complex composed of nine areas for various eating and drinking. The hotel, located near busy JR Shinagawa station as a gateway to Tokyo, commands 360 degree panoramic views of Tokyo. Making the most of the context of the location, the environmental design of the place is shaped in a contemporary Japanese style appealing to cutting-edge customers. This is a showroom for SALIOT (Smart Adjustable Light for the Internet Of Things) developed by MinebeaMitsumi, centering on the innovation of bearing technology. This new lighting device can operate, via Bluetooth, the irradiation position, light distribution angle, dimming, and color temperature. Organic big walls were installed in the interior to show various lighting situations, presenting the possibilities of expressions by SALIOT. The lighting illuminates upscale sculptures, artificial structures, and images of the heart of the mother nature. Beautiful light and shadow feed visitors’ tension and expectation, giving them spatial experience with products of SALIOT. The first day of September, 2017 saw opening of TRADING MUSEUM COMME des GARÇONS on the ground floor of Tokyo Midtown building. Fusing store and museum, this establishment makes a new type concept store. According to Rei Kawakubo, the concept of the store is like “valuable things past, unique contemporary things, not only clothing but things of art and beauty, and a place beyond fashion”. There are white columns to display items.The store sells brand archive items and special goods selected by Rei Kawakubo. On the same day, renovated new COMME des GARÇONS opened in GYRE building incidentally. The store names suggests the store concept is the fifth season. Five colors stained glass is used on the facade. A bar counter is covered with five-on-dice pattern mosaic tiles. The plan of the store meets various customers on various occasions. There are bar area, cafe area, party dining area, and private rooms with grooving open kitchen as the core of the interior. Above all, chef’s table with open kitchen and a lab room with a small window to a kitchen can be attractive. A self-service restaurant was born in a business district in Nagoya city, Aichi prefecture. It is MOLNODA, designed upon a theme of “place for partiality in gourmet”. Generally a kitchen is created in the back of the site. This restaurant, however, has the kitchen near the front facade for visitors to enjoy seeing the interior. A dining area is minimum and a bit cold with mortar finished surfaces, some wood furniture, and a neon sign. A central seating area was designed like a park where people behave in their own way. There are standing seats, high chairs, table seating, and wood deck seating, so customers can feel free in this flexible circumstances. New flagship shop of homeware shop LOFT opened in Ginza, Tokyo. The interior was designed to let shoppers stay as long as possible and the commodity composition was well planed for each floor. The floor area is about 990 square meters and the escalator is located in the center and the main traffic lines start from the center making big circles.The sales areas are located around the traffic lines occupying the same size and leaving the same intervals among them. Checking out counters and LABO, down wear sales area, are off the center, which control and help to migrate the flow of shoppers in orderly manners. Some of LABO products are made by 3D printer, collaborated with Dutch architect DUS. Established in 1816, Gyokusendo is an old copper hardware manufacturer and they traditionally hammer copper ware. Recently the company opened a store in GINZA SIX and the interior is decorated with their homegrown copper plates for floor, wall, ceiling and shelves. The store environment is utterly covered with copper as if it were their big product, so customers can experience their view of the world there. The spatial design tells a lot of their craftsmanship. Ministry of Health, Labour and Welfare last year announced the framing of health promotion law amendment with fine, to beef up passive smoking prevention . In the future, restaurants will either be fully non smoking or have non smoking rooms as musts. Meanwhile, heating type tobacco is in a boom. 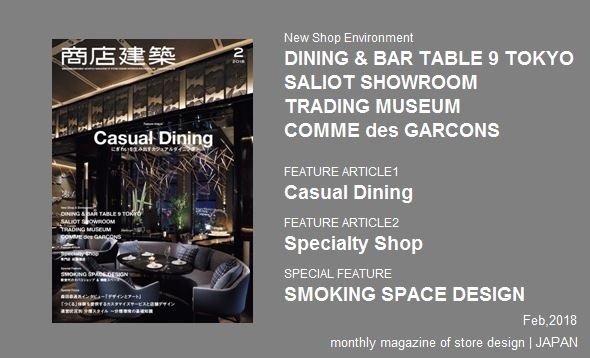 This featured article, under such circumstances, covers interior designers and experts in separation of smoking area to let us know the new approach to design smoking areas in commercial space.